Progress Saturday 28th February 2014. Shop and Pullman Buffet all gave our visitors extra interest. Pways Bubble East Side and sealed 50253s leaking windows. Progress Friday 27th February 2014.
the Bubble ready for the Weekend. 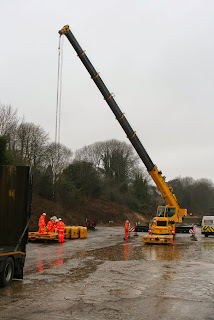 Another most spectacular day with one customer bringing the largest road/rail crane planned to work on the national network designed to erect overhead line masts initially in connection with the Great Western main line electrification. The tests were ably hosted by Joe Marsden from our team and the photo attached shows the scale of the machine. As you will see the weather was foul and Lake Wirksworth was rising but as the day progressed the sun came out to make life a little more pleasant. We had a second customer on site testing laser measurement systems and they seemed happy with their time with us. The PWT had quite a trying day given this morning's weather but managed to achieve more clearance of muck from the route of the third track planned for the enlarged Maintenance Facility. The dmu team tended to a water leak on Iris, replacing a stop/start soleniod on the "Bubble Car" and attempted repairs of its heaters that have been proving troublesome recently.They also tended to some emergy repairs to L J Breeze following a problem with the battery connections. The LMSCA continue their work on the Mark 1 BSK by stripping the cage work in the Guards brake area and the M1M moved seat stored in the Museum to storage and tended to electrics on their SO and SK. 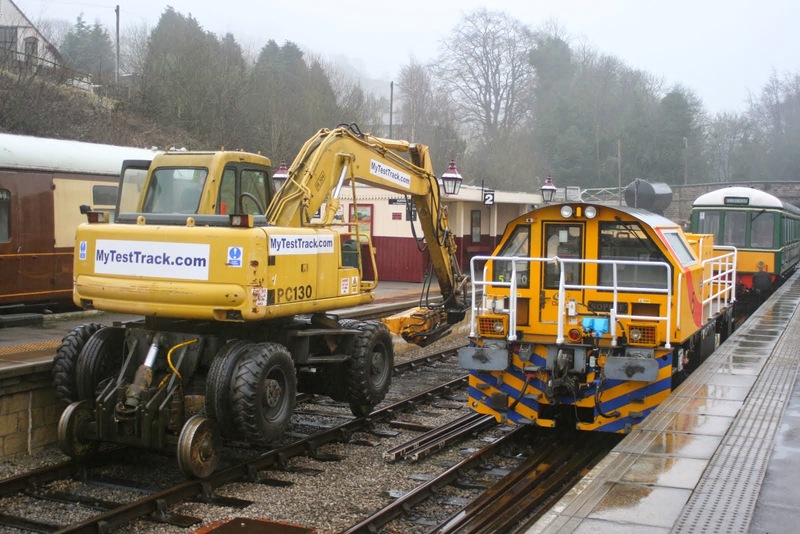 Duffield saw more work to restore the road/rail access point following last week's efforts. If you don't like trams don't open this but it is a masterpiece! Whilst Rodney retrieved some stones at Duffield, the PWay team set about digging out spoil for the new track bed by the side of the shed. They have started this process from the north. 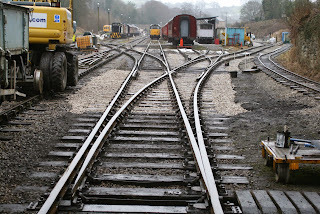 The track will come from north of Cemetery Lane, through the bridge arch and right down the side of the shed. It's a slow going process but they've done enough for the buffer stop so far. The LMSCA used their resurrected compressor to fine blast the floor in the BSK before the kitchen goes in. The EVRA coach team were in action once again. The admin teams were in go mode with more testing work secured, parties booked and more. 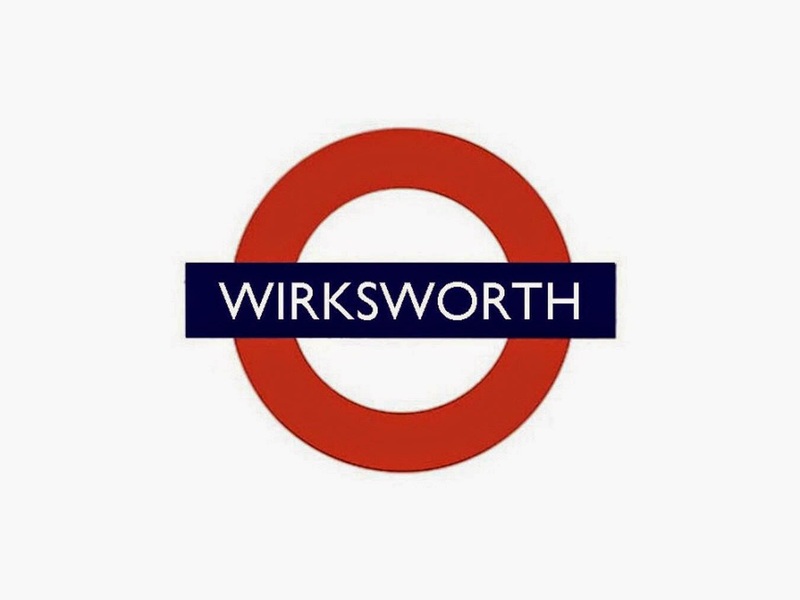 We have a vacancy for a Booking Office Clerk at Wirksworth on Saturday if anybody can help out? Winter was with us again today with sleet, rain , freezing wind and a bit of sunshine to brighten our day. P way made inroads clearing up the mass of material left over from recent relaying works in advance of track laying for the number 3 shed road. Testing of LUL works loco continued with trips up the incline light engine and with the class 31 hooked up as a stand in for a test load. Further brake tests were carried out later in the day all ably supervised by Mike and Rob. LMSCA again on site making further progress with the interior of the BSK with other members of the team working on the LMS rake. Steam team had a visit from the boiler inspector to assess Henry Ellison's boiler as part of it's 12 month ticket. Yet more welding and machining of axle boxes took place. Both booking hall and buffet were open for business with operating staff reporting reasonable levels of passengers considering the weather. Passenger services kept themselves busy with further alterations to their new cave. Today's testing hosted by Rob and Mike. It would appear that everyone is content and Sophie will now leave us for London. A day of sunshine and wintry showers saw Sophie return from Burton-on-Trent after having her batteries charged up. The EVRA coach team were in action once more and the LMSCA rolled up late afternoon to start work (!) after doing the rounds collecting items in the morning. At Duffield, some clean ballast was spread on the car park area of the RRAP. The VCT reported quite a strong team today. Having had two fires, they also did quite well with the anti-sheep fencing south of Hazelwood. 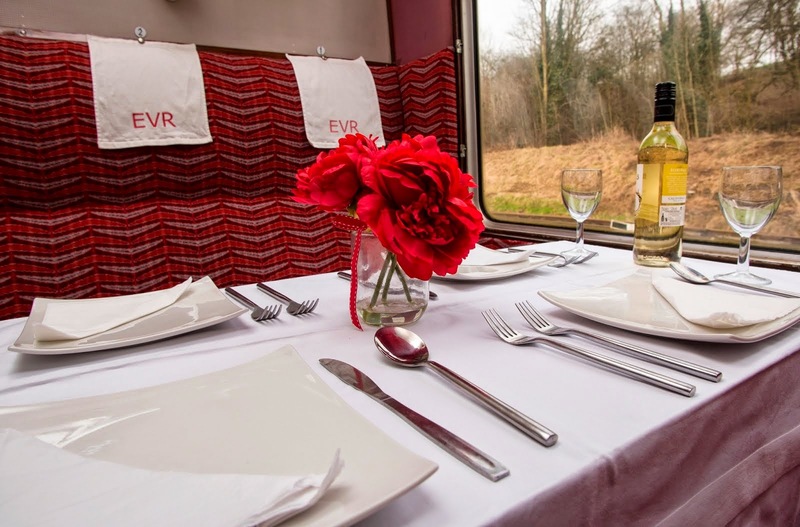 I am pleased to also announce that our new venture for 2015, on train dining, is gradually coming to life. We have started taking bookings today for our Shottle Soirée Friday evening summer dining service. There are 6 Friday evening steam services between Wirksworth and Shottle where we'll serve a four-course meal to your seat. Full details of this can be found on the website at www.e-v-r.com/shottlesoiree and you can book online. 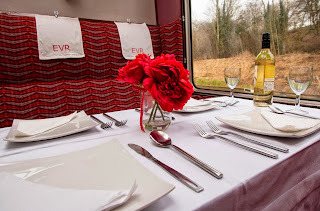 I attach a photograph of a table laid in the new dining train to whet the appetite. A largely perishing day with sleet and snow for most of the afternoon saw us dealing with modest numbers of visitors most of whom were glad of the warmth of the buffet. The Duty Conscript, supervised by JCB Purves, painted the upper Dust Dock fence this morning before the heavens opened. Down the yard, Parkers Parts carried on with the many interior tasks in restoring the EVRA SK, and nearby, the LMSCA constructed and welded the steel walling for the kitchen area of the BSK. In the Pullman set, a number of lighting inverters were changed in the First Class so that people can see us lit up for miles around and Stokes Enterprises attended to some missing panelling in the north end vestibule. In the car park Robson Field-Green replaced one of the defective heaters in unit 55006 and made various motions towards the second one. The train crew, gratefully supported by a senior law officer at short notice, delivered various passengers to remote parts of the universe and some fencing posts to Shottle for the underbridge work. Due to sudden late unavailability I stepped in today. Actually, despite early snow, there was a real buzz about the place today. 52 passengers filled 55006 for the 11:15 off Duffield this morning and the number stayed high all day. Because of this, the buffet and other outlets did well and reported some rather busy periods. A shunt took place to put 50253 into the shed to have some leaky windows remedied. One was sorted in the afternoon after the shunt, which turned out to be a loose little gutter that forms part of the aluminium window frame. It was allowing the water to run down the back of it and into the top of the frame. Opportunity was taken during the shunt to clear the incline of vehicles to help facilitate testing coming up this week. Some fettling of one of the two car DMUs took place; battery charging and the like. Having dried out a bit once in the shed, some surface rust which had formed where paint was thin on the front of 50253 was sanded back to bare metal and primed. The LMSCA are really cracking on with the BSK project. The frame work for a new kitchen bulkhead in the brake compartment is coming along a treat. Work also continued in the EVRA SK with some ceilings being painted and window frames receiving attention. The Duke projected continued underneath their makeshift shelter. Today's photograph is pre-service this morning as the clouds parted. A couple of blasts from the past. The first illustrates the test of a rail grinder from Essen, Germany for Thermit GB prior to being used on Manchester Metrolink. The year was 2004 and like the second video the background scene is interesting showing how far we have come in the last 10 years. The second video is of the late,lamented D2158 Margaret Ann on a trial run in 2005 before the Incline was opened. the Opening of the Pullman Buffet. A day of pouring rain, only to brighten up as the last car was pulling out of the car park! 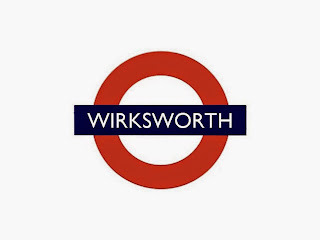 Those who may have been watching on the webcams today could have been forgiven for thinking that there had been some kind of major incident at Wirksworth, but everything is fine. Honest! We hosted quite a few officers of the British Transport Police as they used the areas around the station and yard for training exercises. Some of these officers are based quite a long way away and indeed one van was from Wales. Another test customer was on site as well today with a rather moody road/rail machine. It seemed to have the sniffles and required attention several times in the heavy rain. The Buffet was open for the test customers and Police on site today and did reasonably well out of it. The Booking Office had a bit of a tidy up whilst dealing with calls and the like. The LMSCA took delivery of a blanket-like thing which one assumes is to wrap up the water tank with. The PWay team were at Duffield working on the RRAP again, and Breeze took a trip back up to Wirksworth in the afternoon. A slightly more peaceful day than yesterday with the PWay gang heading to Duffield to start on a smaller scale project to alter the Road Rail Access Point at Duffield. This alteration will eventually enable a better car park surface to be laid there. The LMSCA continued their work in the BSK with most of the flooring now done. They then turned their attention to a compressor that isn't playing ball as they would like to blast some wood clean with it. The Booking Office and clerical team were in go mode with more testing enquiries and other general business. Monday is normally the quietest day on our Railway and after Leigh stepped into the breach to cover an absent Booking Hall clerk yesterday I agreed to him having a rest today. Our regular Monday Booking Hall clerk was in residence and dealt with all the routine enquiries. We were expecting our regular walking stick customer who duly appeared and we welcomed Derbyshire Life for a mutually beneficial six months of planned advertising. The day was very murky in the morning as Mike Billing sets off past Sophie and the "Bubble Car" managing to flail between Gorsey Bank and the Derby Road bridge. He was beset by adversity with a flat tyre to start off with and a recalcitrant starter motor during his endeavours and I am most grateful that he soldiered on! Another most pleasant period passed as a shareholder, following some earlier discussion, arrived with a substantial cheque which will fully fund Platform 2 at Shottle in memory of his late wife who died at an early age on Christmas Day. This contribution fulfils one of our ambitions which would not have been achieved without such kindness. There has been a most gratifying flurry of test track bookings with another firm two days and a likely 10 to 15 days in negotiation. It all bodes extremely weel for 2015. A mildly indeterminate sort of foggy sort of sunshiny day here in Wirksworth. The service trains were reasonably steady for the time of year. The Duty Conscript supervised by Jenkins the Wood removed a large amount of general tat from the car park and also made a start tidying the back of the Training Room. Down the yard the LMSCA completed the flooring of the BSK kitchen area and are now planning a vast and extensive shopping trip to acquire many and varied parts for the rest of it. Our first Saturday service of 2015 attracted a good number of visitors despite the dull weather. The train crew looked after our Driver Apprentice visitors and thankfully the Bubble heater behaved itself ensuring a warm trip down the valley. The LMSCA and 8F teams were in attendance working on their respective projects and the train service was supported by the EVRA shop and Pullman Buffett. In the training room John & Julie delivered their first aid course to a small but eager group of participants. The booking hall dealt with a number of enquiries regarding our summer afternoon tea trains as well as our advance ticket offer and the Commercial department was busy dealing with event enquiries from the local Rotary club and Wirksworth Carnival. All in all a very encouraging day. A fairly pleasant and not unduly chilly winter's day but gradually damper. Down the yard EVRA worked on their SK and SO carriages and the LMSCA were busy applying metal and wood to the BSK kitchen area. Joe Green-Field spent the day changing the heaters on railcar 55006 in an effort to bring some warmth to our hardy passengers. Around the station, the Foremen had a productive session planning the Tannery's forthcoming works and panelling the Tannery store room. I am most happy to report that today's testing with Sophie went extremely well and my thanks go to Rob, Joe and Graham for ensuring we had very happy customers. The Class 31 and LMS Brakevan formed an unusual load for Sophie, Battery Locomotive No5, as the customer established a life cycle for the new batteries under load. Their activities are shown on this video clip http://youtu.be/tfnHFSMzVP0 My thanks go to Julie who ensured the foot crossing between the Wirksworth platforms was closed as the test consist passed many times. We also had a half term service day with the "Bubble Car" with surprisingly good loads considering we had a dull, cold day. The PWT engaged themselves in technical stuff surveying the optimum trajectory of the proposed new Maintenance Facility siding and the repositioning of the fuel tank and waste oil store with the appropriate bunding. A start was made to dig out and load spoil from the track bed of this new project. The M1M tended to the new electrics on their SK and the LMSCA secured the flooring of the guards compartment of their BSK. Down south Duffield saw further removal of material from the road/rail access point in preparation for its lowering. The EVRA shop, Model Railway, Booking Halls and Pullman Buffet Car supported today's activities. A most satisfactory and profitable day. I am also most grateful to shareholders who have responded to our latest plea for funds as, amongst our many other desirable projects, the wheels are turning to obtain the Transport & Works Act Order that will finally enable us to be master of our own destiny. The first official notices have been placed which will no doubt tease out some testing and trying responses! Another great first for our Railway! Still a chilly day for half term trains but passenger numbers weren't too bad for the time of year. The Permanent Way Fast Action Response Team dispatched themselves by rail this morning to MP137 to replace the cracked fishplate that Mick reported on yesterday. 24 hour emergency response it says here, oh sorry, they'll do it within 24 hours! They then set about routine tasks including greasing slide chairs in the yard. I suppose the big news of the day is that we welcomed the arrival of the first battery locomotive from Clayton's in Burton-on-Trent. 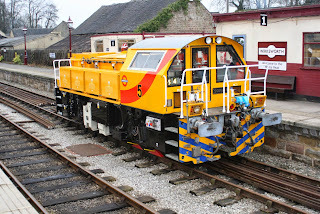 The locomotive's were originally built by Schoma and had a diesel engine in them but now they have been converted to work via third rail and on battery power. The locomotives are to be put to work on the London Underground network and will be most useful during possessions when the live rails have to be switched off. It was remarked that two years of design and build effort had gone into the conversion but until the locomotive actually worked in the yard this afternoon, they had no idea it was actually going to work! This is why it has come to be put through it's paces. Martin will send out a Supplement later with some photographs. The LMSCA continued the fitment of the water tank to the BSK. Not a bad day if a tad chilly. More trains tomorrow if you fancy a ride and a bite to eat in the Pullman. Progress Tuesday Feb 10th 2015. A not so delightful day with low cloud keeping the temp just above freezing. started, the spoil heap resulting from the re timbering of said turnouts loaded to the Rudd, full track patrol completed with the discovery of a broken fish plate at mp 137, a full set of crossing timbers sorted from our stock for the new turnout to shed road 3 and a start made on the new location for the diesel storage tanks. LMSCA continued work on the BSK with the water tank frame work completed , work on the gangway on LMS BTK and woodwork on the LMS open. Steam team continued with welding axle boxes, preparation for Henry Ellison's boiler ticket and further work refurbishing parts for Cathryn. Booking office was open for business on our first day of the operating season along with the buffet both seeing a good level of business, indeed, one bloke arriving by train from London to inspect property in Wirksworth , and , having completed his business returned home the same way which goes to show that now, buying a train ticket at London St. Pancras to Wirksworth is nothing unusual. DMU team seemed to be in the singular and busied himself with the units berthed in platform 3 and assisting p way with a spot of shunting. Almost spring-like in the Gem today which saw a reasonable turn out of volunteers for a Monday. Basking in the sunshine was the Head of Gardening, Lynette, who began attending to the car park bank. The LMSCA continued working on the BSK in readiness to install a kitchenette. It doesn't seem too far away now! Flailing took place today with it working south from Wirksworth and the VCT had a couple of fires down south of Hazelwood in readiness to continue their fencing quest. The M1M were working away on their coaches too as the EVRA shop was sorted for tomorrow. The Booking Office completed a few final tasks ready to fling the doors open in anticipation tomorrow. See you there? A lovely sunny winters day. Down the yard the LMSCA fitted the superstructure of a water tank frame to their BSK and refurbished a gas bottle holder. The DMU team cleaned heater ducting in unit 253 and renewed window rubbers in the class 108. Village Green spent the day salvaging parts from a duff desk. Nearby, the Austerity team carried on with painting the Duke and adjusted their brake adjusters. In the carriage sidings EVRA worked on the SO and the SK and just round the corner, the Class 31 received routine maintenance. Around the stations, at Duffield work continued on the car park and at Wirksworth the guerilla gardeners continued the hedging of the east embankment. The most urgent work of the day was fencing off the former Beer Container area to prevent the public wandering into the yard from the car park. I attach an image of the fencing team standing in front of the Oscar Stinchcombe-Jenkins Memorial Fence and International Mower Storage Facility. In the Tannery, JCB Purves (incorporating Belper Beds) carried on with painting and a vast spread of magnolia reached the ceiling and the doors began to receive Wyvernrail Railfreight Grey. Warm up they said. Yeah right! The last Saturday before trains start saw a few groups on site. The LMSCA continued with the BSK working on a frame which will house the new kitchen water tank when its delivered. Some of the others continued on the Brake Third Open. The 8F Group helped out on The Duke. The DMU Team found themselves completing the engine rebuild on Iris. The vehicle was noted as failed on 28th October 2014 when it was discovered that the cylinder head gasket was blowing. It has taken until today to rebuild the engine due to various reasons, not least the fact that some parts had to be overhauled and manufactured new due to spares for these rather old and obsolete engines not being available. It took a bit of tweaking to get the timing right on the engine but it is now pretty sweet. A couple of runs up and down to Gorsey Bank to set up the idle speeds and other items also proved that the engine was free of leaks. A B exam is now due and it can be used to carry passengers once again. The Buffet was open and caught some passing trade along the way. A bright if rather chilly day here in Wirksworth. The EVRA SO received attention as did the LMSCA's BSK, in the way of flooring this time. Down the yard, Field Industries arrived to rejuvinate a dead heater, and we look forward to gathering round it very soon to warm our parts. The Passenger Department also gathered for a meeting of the senior staff in the Tannery and this concluded with a great deal of measuring up and cogitation on the nature of partitioning, and much the same in the Stores with the kind assistance of Stokes Enterprises (Managerial Division). The afternoon was taken up by the Foremen removing a large muchness of ivy, assisted by a sprightly young person, and the back of the Mess Room is now rather more presentable and accessible than it has been for some time. Our new training customer used the Pullman Buffet Car for more interviews of potential candidates as their first course members near completion. The PWT completed P10 and began to clear the site after a most splendid period of weeks working in the most unpleasant of conditions. The two photos record the huddle required during reconstruction and the second show the end product. Our team have installed a new crossover, reversed the single slip and renewed the pointwork exiting the car park using some £6,000 of crossing timbers, sleepers and associated track furniture to very good effect. They should be on the end of all our thanks as, has often been said, no track - no trains. The dmu team continued to deal with a cylinder head on Iris and shunted much stock to prepare for our first London Underground battery locomotive next week. We welcomed a visitor from the pioneer Torrington railway project and the M1M continued with the refurbishment of their SO. 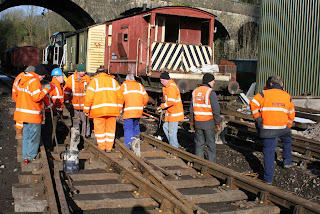 The LMSCA continued with their project to restore the Mark 1 BSK which will provide catering back up to this year's experimental Afternoon Tea trains. The Booking Hall continued to receive business for the forthcoming main season. Another very good day considering the miserable, cold conditions. Well not a bad day, pretty cold but plenty of winter sunshine. The Pway team finished the infamous P10 having relaid it in just 4 days. This most useful effort has been the latest in a series of relays in support of upcoming testing. Testing which may not have been able to take place if they hadn't helped out. ARC conducted interviews again in the Pullman and much admin took place in preparation for train services starting on Tuesday. The LMSCA continued working on the BSK as they prepare to lay the new floor in the brake compartment. Despite the best efforts of the Met office we again had a most pleasant day. P way continued with re timbering turnout P10 and after 3 days all is back together with ballasting and packing left to complete the job. The Booking office had further business taking advance bookings and amongst other duties stuffing envelopes with the latest shareholders news letter. LMSCA were busy again on the BSK. Steam team continued with welding up and machining axle boxes, preparing Henry Hellison for a boiler exam and further work draw filing the rods off Cathryn to make them look pretty. A lone worker at Duffield has been clearing off the rails on the RAPP ready for lifting, digging out and relaying about 6 inches lower to allow surfacing of the car park at a later date. VCT were again out in force at mp 134 with 6 men warming themselves with 3 fires. 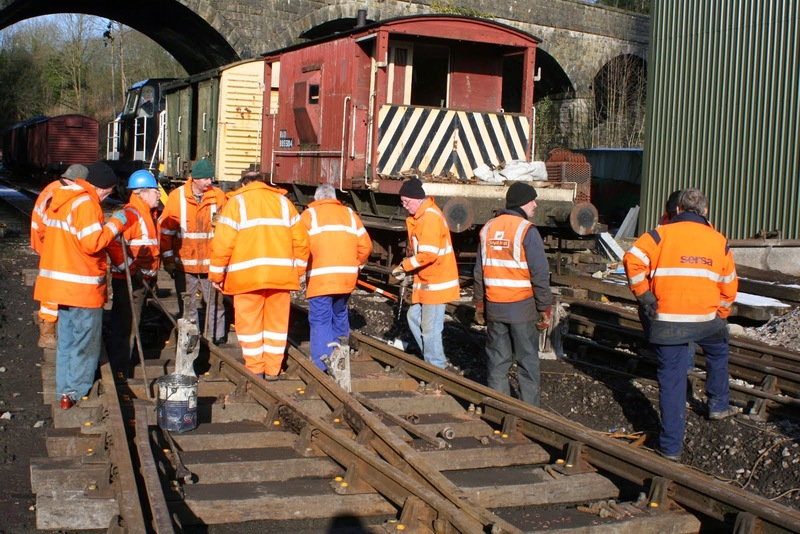 DMU team had much shunting preparing the trains for next weeks 3 days of public services. The first Monday in February saw possibly the quietest of the year so far. We welcomed Aaron for a weeks work experience a day earlier than expected but he was most useful, stuffing approximately 400 envelopes for our first mailout of the new season. The Booking Office took a booking for a diesel experience and completed other general admin work. At Duffield, some stone was removed from around the RRAP as part of a general tidy up. Calm before the storm... trains next week from Tuesday 10th! A sunny if rather chilly winter's day here in the Peak, nevertheless we were delightfully occupied on a number on fronts. Down the yard work proceeded on the EVRA SO and the LMSCA inserted an amount of wood into the doors of the BSK, as well as measuring up for an overhead water tank to supply the kitchen facility being constructed in that carriage. In the DMUs seat legs were cleaned and primed and heater ducting cleaned. Village Green carried out an A exam on unit 55006 and this was pronounced entirely satisfactory. Around the stations, at Duffield the Station Foreman began work on agreed p-way related preparations in the car park, and at Wirksworth stock and shop items were sorted in the EVRA shop. Overlooking our endeavour, the guerilla gardeners were clearing a swath of overgrown hedge in order to bring greater light to their sunny patch. Not far away Field-Hodgkinson Enterprises were creating a patch of their own with the application of the steam cleaner to 1 car, 1 van, 1 railcar and 1 heater casing. Further work continued on the Pullman. In the Tannery Store the Purves-Shone Show was occupied painting the area to be developed into our new Passenger Stores. I attach a couple more pictures of the interior we are working on at the moment. A small slightly coughy dog is included for scale.